Fortunately, the war of formats between DVD-R/RW and DVD+R/RW has actually finished thanks to the new DVD-Dual format which put an end to the disputes which one is better. This format combines recording capabilities of both DVD-R/RW and DVD+R/RW in one device. All main competitors from the camps of DVD-R/RW and DVD+R/RW promised to back the new standard. Pioneer, Sanyo and Hitachi, and a bit later Ricoh and Philips will produce pickups for the DVD-Dual. So, the only thing for users to choose will be a media type - the war of formats is over, but the war of discs is probably just starting :). But this seems to be more convenient for a user. It's simpler to buy a disc and record it on the DVD-Dual than to choose between the drives which are much more expensive. The first drive of the new format on the market is one from SONY, DRU-500A, and we will test it today. The big nice Retail box contains the drive, an IDE cable, one Sony's DVD+RW, screws for the drive mounting, two CDs with software and e-version of the manual and several brochures with useful information. The front panel is not conventional; when the tray opens, it looks as if the upper half moves toward you. There is only the Open/Eject button; the controls for direct listening to Audio CD are not here. The button is deeply recessed which prevents accidental pressing, but on the other hand, it's not easy to find it by touch and press. The software suite coming with the drive is impressive. Sonic MyDVD 4.0 is a popular with novices packet of programs for making professional DVD and Video CD of nonprofessional movies. VERITAS RecordNow is a program for copying DVD and CD and also for creation of DVDs; it's a good choice for a beginner. VERITAS Simple Backup is a full-featured program for making backup copies and data protection, also supporting background copying and data recovery after failing. Arcsoft ShowBiz - video editing program with tools for making unsophisticated home video of video records; supports import/export to the MyDVD software. MusicMatch Jukebox 7.1 is a well-known program for listening to musical compositions and creation of your own MP3 albums. CyberLink PowerDVD 4.0 XP is one of the most popular software DVD-Video players which, apart from DVD-Video, plays Video CD. The drive was released in November last year and first it came with the firmware version 1.0d, now it's replaced with 1.0f. The new version supports recording of DVD+R at 4X and has the read speed for DVD lifted up, though it's not specified up to what level. The new version has some negative effect as well. Some of the users complain that the drive does not write Princo 2x discs at 2x and allows only for 1x. Reportedly, there are also Power Calibration Errors when any discs from Princo are used. The installation of the drive is simple, like that of any CD-ROM drive. It requires no special drivers. And I used the NeroBurning Rom ver 5.5.10 which has successfully detected this device. 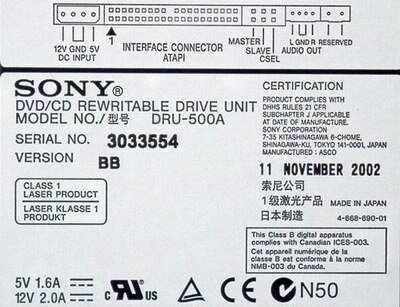 The drive supports the Power Burn technology, the buffer underrun error prevention technology from SONY. Besides, it also supports the Lossless Linking technology - a version for buffer protection in case of DVD-R and DVD+R media. The recording process can be halted and then resumed from the same place, but without this technology there can be some free space after the interruption which might cause problems for home DVD players and some computer DVD-ROM drives. The formats and media types supported can be found out with the Nero Infotool. 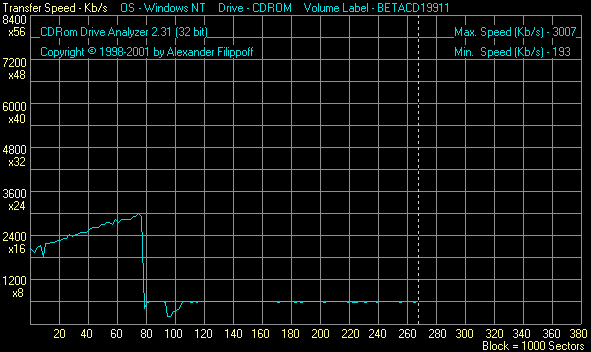 Traditionally, let's see how this drive is detected by the most popular program for audio track extraction. Well, the drive has everything for quality operation with audio tracks, let's see how it uses them in practice. According to the preliminary results and the specs, the drive promises high performance and ease of use. Now we are moving to the tests. Looking though leaflets supplied with the drive I found two bright red ones which made me test operation with DVD-R first of all. It was written there that Verbatim warns that early 2x discs from Verbatim can cause a record error on this drive. The following types are under suspicion: Reorder number 43136 and 43166.
work nicely on this drive at 2x. I also found a similar warning from Pioneer which notifies about possible write errors in case of DVD-R discs of the DVS-R47A/EN type. After that I actually tested compatibility with the DVD-R media that I had. The results are not so sad. 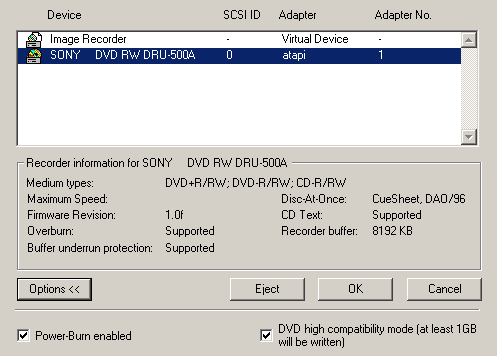 The cheap noname discs which were detected as clones of TDK and which were earlier successfully recorded at 2x on the popular DVD-R drives Pioneer DVR-104 and Toshiba SD-R5002 failed on the SONY DRU-500A. Now they can be recorded only at 1x, as well as the old TDK's discs certified for 2x recording. Well, everything that has the following Lead-In, will be recorded at 1x. 00 42 00 00 01 40 C1 FD 9E D8 50 00 02 7A 0C 15  .B...@....P..Z.. The other discs with the TDK identifiers in Lead-In can still be recorded at 2x, in particular, some TDK clones such as eProFormance. They are less expensive than TDK's models and have good quality. The Lead-In is as follows. I also recorded two Princo's discs. The procedure was flawless, though only at 1x. Although it's not statistics, it contradicts to those users who say that this drive doesn't work at all with Princo's media. So, the verdict is that users should choose DVD-R media very carefully. Fortunately, there were no problems with the DVD-RW media. The discs of the DVD+R/RW format were recorded flawlessly as well. The test recording was accomplished on the eProFormance discs for the DVD-R format and on the Verbatim LiveIt for all the rest. Drive write time at 1x, min. write time at 2x, min. Drive write time at 1x, min. Drive write time at 2.4x, min. Here you can find the data of control reading for all recorded DVD discs on two reference DVD-ROM drives Toshiba SD-M1712 and Pioneer DVD-117LJ. As you can see, reading of all the discs is stable and error-free. Unfortunately, I didn't have a chance to test the DVD+R and DVD-R media at 4x as the discs certified for such speed are lacking on our local market. Also, I couldn't test recording of DVD-RW discs at 2x. Well, this drive reflects the struggle of the current formats, or rather, their parity. 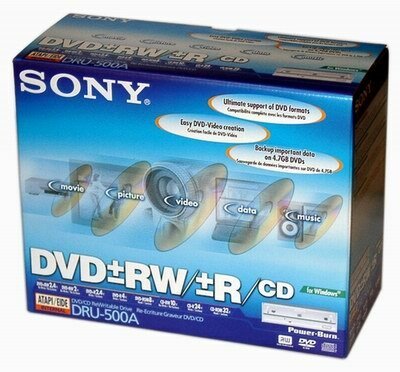 The DVD-RW media have come very close to DVD+RW in the write speed; no sooner had the DVD-R made a step forward thanks to the write speed of 4x, than the new firmware version from Sony provided the DVD+R with 4x support. There is nothing unexpected, except a low speed of operation with the one-layer DVD-ROM (Data), - this problem can be caused by fact the the drive treats differently the discs it doesn't like. In the DVD read speed the SONY DRU-500A is very similar to the PIONEER DVR-104 which doesn't hurry at all when reading discs of this type. 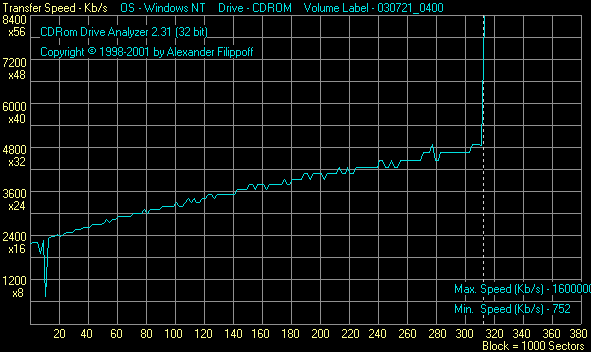 As the SONY DRU-500A drive switches on the Z-CLV mode for recording discs at the maximum speed of 24X, the tests were carried out with the Nero CD Speed program. It's able to give the graphics results relative to the current write speed; so, we will find out how the Z-CLV mode affects the gradual write speed change of this drive. CD-R SKC (cyanine) and CD-R Philips Silver Premium (phthalocyanine). Well, the drive has no preferences regarding the surface types. But there can be some problems in recording CD-R: if the drive doesn't fancy a disc, it will record it at a lower speed. It was found out when we tried to record discs from CMC Magnetics and Prodisk. CD-R recording, phthalocyanine, Prodisk 32X. 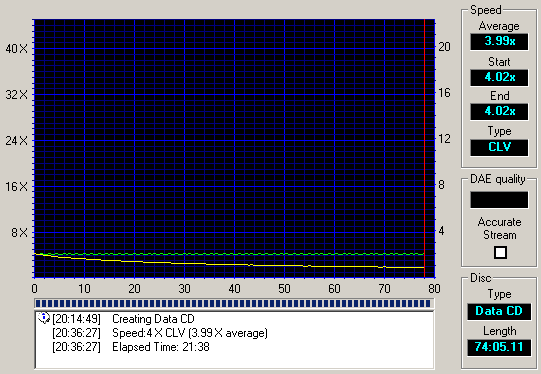 As you can see, the drive fixed the maximum write speed for the disc and stuck to it. The tests were carried out with the device described here. BLER factor for the SONY DRU-500A drive. The recording quality of this drive is good enough. As you can see, the CD-R disc from Prodisk, which the drive didn't like, has a much higher level of errors compared to the other two CD-Rs. The SONY DRU-500A doesn't support Overburn. The attempt to test it with the NERO CD Speed wasn't successful. 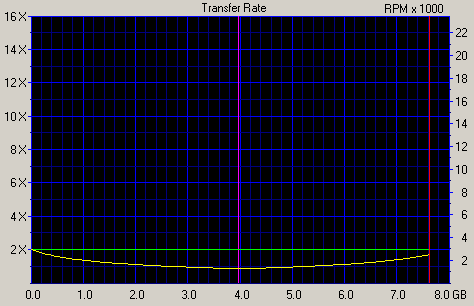 Time of CD-RW full formatting in UDF with directCD 5.02b. CD-RW recording in UDF, 650 Mb test packet in 6500 files. Testing ability of the drive to work with 80mm CDs by the example of a CD-RW disc. The drive works nicely with the 80mm discs. The only problem was that the drive agreed to record the 10x 80mm disc from Dysan only at 4x. As you can see, in case of the low-quality disc the drive reduced the speed immediately when the errors appeared and didn't make any attempts to lift it later. Such approach can be very unpleasant for a user if all such discs will be read at 4x. The drive couldn't read the 780MB disc, - there were errors at the end and the drive displayed the warning; the next several attempts were useless either. Index (5): 13 -> incorrect! The drive perfectly captures audio tracks. It can be recommended for those who make their own digital audio albums. The detailed information on the tested parameters is given in the help file to the Nero CD Speed test program. The DVD video was played without any problems. No artifacts were noticed. 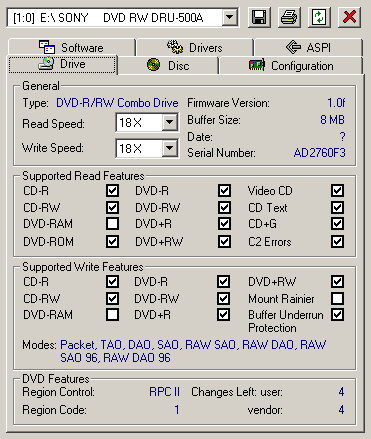 We also estimated quality of playback of movies recorded on DVD-R/RW+R/RW discs on the home DVD player BBK931. The playback was nice. Physical characteristics of the drives. 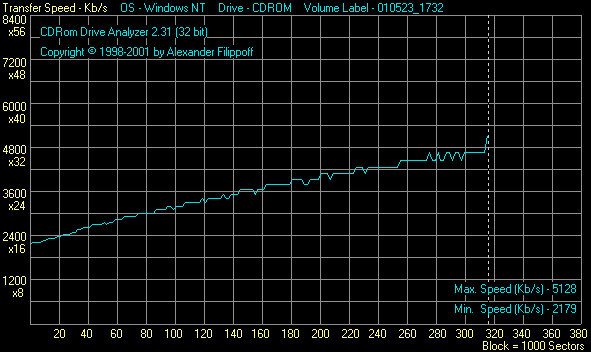 On the whole, the drive works quietly except some cases of operation with badly balanced CDs and operation at the maximum speed. The thermal conditions are ok. But I don't recommend to place any devices close to it to avoid their overheating. In operation with the unbalanced disc the drive vibrated, but it didn't prevent it from flawless reading of the disc, though the read speed wasn't high - 4x. According to www.firmware-flash.com/ it's still impossible to change the status of the drive from RPC-2 (region locked) to RPC-1 (region free). At last, the two competing formats are combined in one device developed by SONY. The new format DVD-Dual has confidently stepped out on the market. The SONY DRU-500A is a powerful tool for DVD recording which supports all latest innovations of both standards. Certainly, there are some downsides: it treats discs differently and has a low read speed for recordable DVD. Also note that it will be a bit dearer than one-format drives, but it won't be too much for a possibility to record all possible DVD types on one drive. All in all, the SONY DRU-500A drive is a worthy solution of the new DVD-Dual format.